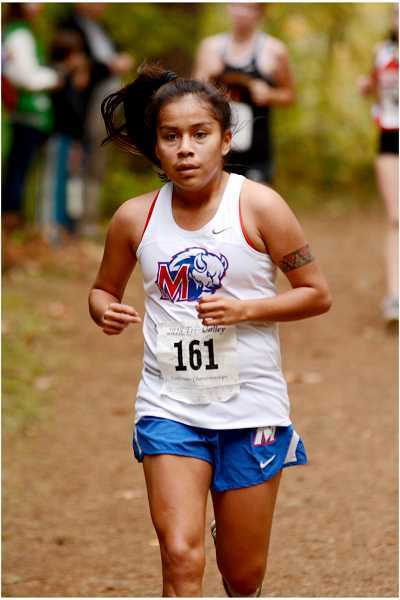 Senior Vanessa Culps first Madras female runner to qualify for state since 1998. The Madras cross country team participated in the 4A-2 Tri-Valley League championships on Oct. 24. 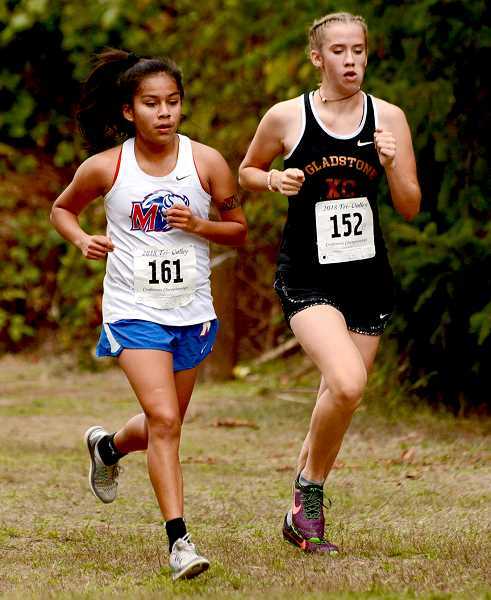 Female runner, senior Vanessa Culps, was the highlight of the team, placing second during the league championship race in Estacada. Culps finished with a time of 22 minutes and 22 seconds. This is the first time a female runner from Madras has qualified for state since 1998. Amy Harris qualified for state 20 years ago and placed 28th. "We went in with the expectations that she (Culps) would make it to state and she delivered," head Madras cross country coach Andrew Jensen said. "We talked about getting up early in the race and she executed perfectly. She took the lead and we had no idea that would even be an option. Going forward in state, we are just going to go out there and run the best she can." The first-place winner was Rowan DeLine, of Corbett. DeLine was able to finish the race with a time of 22:12:81. Brynn Tatom, of Gladstone finished in third-place with a time of 22:33:19. The next White Buffalo runner to cross the finish line was junior Eryn McCourtney. McCourtney had a time of 24:09:32 and finished in 16th place. "I was so scared," Culps said, recalling her preparation before the race. "I kept thinking, am I going to go to state, reach my goal to be top three? When I was in third place during the race, I was trying to decide if I should pace myself or go harder. I ended up being in the lead for a while and was in shock." "I was kind of disappointed, but I am still happy I get to go to state," Culps said about finishing second. "I am just going to give it my best and try and PR (personal record)." A pair of sophomores, Jayden Davis and Anny Huang, finished in 18th and 19th place for the Buffs. Davis finished with a time of 24:38:83 and Huang 24:49:95. In the Tri-Valley Conference team scores, Gladstone finished in first place with a score of 35. Estacada placed second with 47 and Madras was able to place third with 79 points. Corbett finished with 94 points and Molalla, 100. For the men's cross country teams, Gladstone placed first with 26 points. Molalla and Estacada tied for second with 51 points and North Marion placed third with 111. Madras came in fifth place with 122 points and Corbett -sixth, with 168. The first White Buffalo to cross the finish line for the Madras men's team was Hunter Fitts. Fitts finished in 12th with a time of 18 minutes, 47 seconds. Jack Brown, of Gladstone, finished in first place with a time of 17:09:28 and Konnor Hathaway, of Gladstone, had a time of 17:17:06 to finish second. Sophomore Grayson Symons finished the race in 22nd place with a time of 19:30:09 for the Buffs and junior Leander Smith had a time of 19:38:73 to place 24th. "Overall they did awesome," Jensen said. "Out of the 27 runners, 24 PRs. So 24 of them ran their best time at districts, which is amazing; that is all I can ask of them." "As a team, we came in ranked last for both boys and girls," Jensen said. "Girls had an amazing day. They ended up third and we knew they could pull it out. Super positive day and we are really excited about both team accomplishments and individual accomplishments."